Mix jalapeño chili, garlic, chili powder, oil, lime juice and salt in 3- to 4- quart slow cooker. Add chicken; coat with oil mixture. Remove chicken from cooker; place on cutting board. Shred chicken, using 2 forks. Return chicken to cooker and mix well. 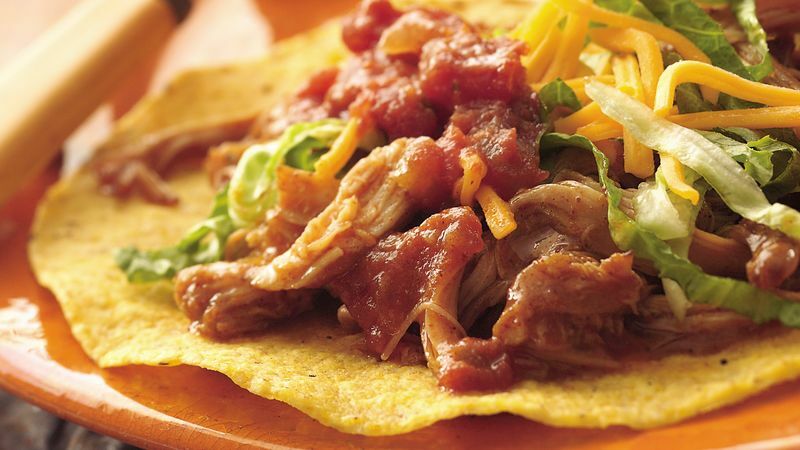 Using slotted spoon to remove chicken mixture from cooker, place 1/3 cup chicken mixture on each tostada shell. Top with lettuce, cheese, salsa and sour cream. For an added fresh-tasting garlic kick, stir an additional 2 finely chopped garlic cloves into the shredded cooked chicken. Mexican rice and beans complement these tostadas. Margaritas add to the Mexican theme.